standing on wing, rear (l-r): Peacock, Whittle. 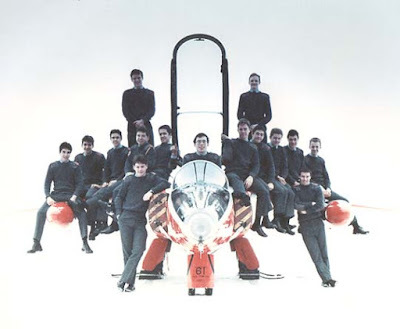 sitting on wing (l-r): Purser, Kilgour, Hodgson, Down, Phelps, Smith (cockpit), Gaze, Cook, Bilney, May, Spencer. This picture was taken at the time of completing our airfieled training, very close to passing out from the apprenticeship. It was taken on a snowy, cloudy day so the whole background has faded to white, giving an impression we are actually floating. Not even we were good enough engineers that we cuould make a Gnat float . . . The Gnat was the aircraft we used to practice our overall training and skills on in the hanger in a 'real' environment. We had to remove various major componants and rebuild the aircraft. This included the engine, which was subsequently test started once the exercise was complete.